On Saturday, November 5, 2011 the Yves Saint Laurent Pierre Bergé Foundation announced that muse and designer Loulou de la Falaise had died after a protracted illness aged 63. Rive gauche-chic incarnate, de la Falaise – daughter of a Schiaparelli model and a French count – once famously declared that all French women were “all entrance, effect, brilliance”. The archetypal Parisian haute bohémienne was defined by her cropped hairdo, dramatic make-up framed by thin arched brows, signature patterned head wrap, and the kind of angular bony figure and effortless posture that, according to Yves Saint Laurent, made his dresses “look as if they are about to float off the body”. Her androgynous frame and effortless elegance set off masculine tailored styles perfectly; she was allegedly the inspiration for Yves Saint Laurent’s historic female tuxedo, Le Smoking. 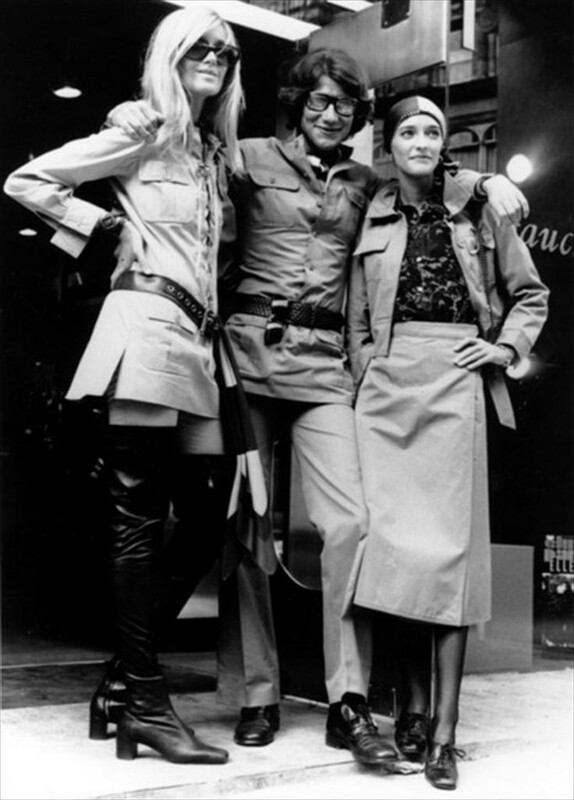 Yves Saint Laurent’s muse, collaborator, and rumoured financial investor joined the fashion house officially in 1972 and stayed working with the company until around 2000. In the 1970s, she, along with Betty Catroux and Catherine Deneuve, made up a troupe of chic sidekicks known as Les Fidels. Before the term it-girl had entered the public consciousness, Time magazine rather charmingly referred to the trend-leader as a "girl gadabout" in a 1971 fashion feature focusing on the resurgence of the net veil. Jet-setting between the world’s fashion capitals, de la Falaise designed Halston’s colour-saturated prints in New York before settling in Paris and becoming acquainted with Saint Laurent. Hypnotised by the bright jewel tones of Morocco and the bold oversized jewellery of North Africa, de la Falaise worked on costume jewellery for Yves Saint Laurent, and later for her own eponymous label. She was responsible for designing the label’s iconic chunky cuffs, which are continuously referenced, reimagined in gold-tones, bright enamels and coloured glass and resins. In her autobiography Just Kids, Patti Smith, recalls some of de la Falaise's arm candy: “…She wore a heavy African bracelet, and when she unclasped it, there was a red string tied around her tiny wrist, placed there, she said, by Brian Jones,” she writes. Even alive, she was, to many, more mythical than real – a woman who didn’t just set the fashion agenda but seemingly made an attitude and a carriage - slouched - de rigueur. And, with a signature aesthetic that sits somewhere between 1970s iconography and timeless, heady fantasy, the gilt Rive Gauche style icon lives on as representation of excess, extravagance and elegance of an era long gone. Suggested Reading: Natasha Fraser-Cavassoni considers Loulou de la Falaise in her Inner Chic column.